The HW sealed connector series is a new, improved version of the conventional HM sealed series, with a mechanism that detects when terminals are not inserted completely. This series consists of a 090 type classified according to terminal size, supporting use in a variety of control circuits and low power circuits. 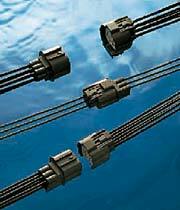 -1-6 way connectors adopt an inertia locking system to prevent semi-engagement. -8-14 way connectors is only possible when the locking mechanism ensures the connectors are completely engaged, preventing semi-engagement.